Range of temperature: -10 to +60 degree C.
We are offering Cylinder For Hollow Block Machine to our clients. We are involved in manufacturing, wholesaling and exporting an eminence range of Heavy Duty Hydraulic Cylinder, which is fabricated at par with global principles from well class basic material. We also accept customized Heavy Duty Hydraulic Cylinder as per specific requirements and different spares are also available with us. Indo Fluid Power Pvt. Ltd.
We are one of the noteworthy manufacturer, suppliers, and traders engaged in offering superior quality Heavy Duty Hydraulic Cylinder. This cylinder can jack 5 to 3000 tons easily. 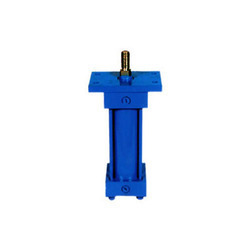 We are one of the leading manufacturers of Hydraulic and Pneumatic Cylinders and Power Packs based at Bangalore. Since 1991 we are in this field and supplying good quality products as per customer requirements and at reasonable price. Quality assurance is an integral part of our manufacturing process.